Thomas Morgan, long time resident of Ponca City, passed away Monday, April 16, 2018 at his home. He was 82 years old. He was born on January 3, 1936 in Pawnee, Oklahoma to his parents, Arthur and Rose (Noerr) Buffalohead. He married the love of his life Dorothy Nottingham on September 28, 1957 in Sallisaw, OK. They resided in Dallas and raised their family there, moving back to Ponca City in 1987. 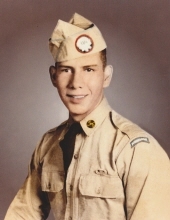 Tom joined the Army in 1953 and served as a paratrooper. He worked as a meat cutter for most of his life and later owned and operated Tom’s Tires on South 7th for 25 years before retiring. He loved being active, gardening, being with his pets and most of all his family. Tom was a very caring man who worked hard his entire life to make sure his family always had everything they needed. Tom is survived by his wife of 61 years Dorothy Morgan and children; Debbie Norvell and husband Jim, Cathy Jackman and husband Bryan, Tommy Joe Morgan and wife Becky, Janice Morgan and husband Raymond, and Cindy Morgan. Grandchildren; Tonya Burleson, Brian Norvell, Angela Rickman, Michelle Jackman, Nicole Jones, Tommy Morgan, Sarah Bernal, Kristen Morgan, Alex Benitez, Zachry Benitez, Becky Benitez, Jeremy Mixon, James Morgan, Justin Morgan, and Cody Morgan, 20 great-grandchildren and 5 great great-grandchildren. Sisters Leann Jones and husband Wayne of Collinsville, Jane Conway of Muskogee, and Anita Willis of Del City. He is preceded in death by his parents, Arthur and Rose Buffalohead, brothers Pat Buffalohead, Bob Buffalohead, Don Buffalohead, Norbert Buffalohead, Roger Buffalohead, and sister Lorraine Nobles. A funeral ceremony will be held at 2 pm on Thursday, April 19, 2018 at Trout Funeral Home Chapel with Chaplain Mike Sweetman officiating. Burial will follow at Round Grove Cemetery and a meal will be served at Ranch Drive Baptist Church directly afterward. Arrangements are under the direction of Trout Funeral Home & Crematory. Casket bearers will be James Morgan, Justin Morgan, Cody Morgan, Jeremy Mixon, Tommy Morgan Jr., Tommy Morgan III, Kaidon Mock. Honorary casket bearers will be Brian Norvell, Jacob Jackman, Gavin Rickman, and Cole Jones.